Penn Manor superintendent Mike Leichliter is recommending the hiring of Baron H. Jones as principal of Penn Manor High School. Currently principal of Conestoga Valley Middle School, Jones would take over his new position from Dr. Phil Gale on July 1. The school board is scheduled to vote on Jones’ appointment at its April 15 meeting. 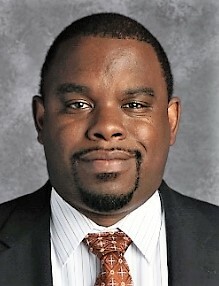 Prior to joining the CV Middle School staff as principal in 2015, Jones was an assistant principal at Spring Grove Area High School from 2008 to 2015. He also taught secondary social studies for the School District of Lancaster from 2001 to 2008. Jones, 39, received his master’s degree in Educational Leadership/Principalship from Widener University’s Graduate School of Education in 2008 and his teacher certification from Millersville University in 2005, with an emphasis on technology integration. He also earned a bachelor’s degree in political science from Jacksonville State University in Alabama in 2001. Jones is a Leadership for Diverse Schools presenter and served as diversity coordinator for grades 7 through 12 at Spring Grove Area School District. He lives in Manheim Township with his wife, Georgia Jones, and their sons Brayden, 10, and Quinten, 8. Jones was attracted to the high school post at Penn Manor because of the district’s reputation, he said. Jones is being recommended for the principal position following a three-month search for a replacement for Gale, who begins his new role as Penn Manor’s assistant superintendent for secondary education July 1.